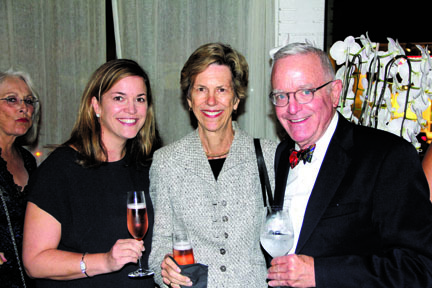 MEALS ON WHEELS supporters at the Petrossian event included Neville, Betsy and Carl Anderson of Hancock Park and Windsor Square. Since 1977, St. Vincent Meals on Wheels (MOW) has served homebound seniors in Los Angeles. The organization spent much of 2017 celebrating its 40th anniversary. Celebratory (and financially supportive) events were presented all last year. Spearheaded by MOW’s locally based support group, Cuisine à Roulettes, which was founded by Nelly Llanos Kilroy and other area women, the anniversary events were fun and fiscally rewarding. In early April, a kickoff Culinary Cause Brunch was hosted by actor and musician LL Cool J with special guest Magic Johnson. 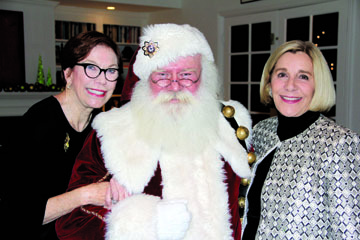 Paula Marcus, Ann Brunner and other neighbors raised over $100,000 for MOW. Later that same month, the Beach Walk/Bike-a-Thon was emceed by Hancock Park neighbor Fred Savage, and Jeni’s Splendid Ice Creams of Larchmont provided treats for all participants. Then, in June, Sister Alice Marie (Sister SAM), the program’s beloved founder and executive director, died unexpectedly at age 82. In her honor, the staff recommitted to her mission of bringing food and love to homebound seniors. SANTA was joined by Meals on Wheels acting executive director Daryl Twerdahl (left) and party hostess Brenda Cooke, both of Hancock Park. MOW’s autumn was highlighted by Evening on the Beach, featuring some of the best chefs and winemakers in California. More than 650 guests enjoyed food, wine and music while watching the sun set over the Pacific at the Jonathan Beach Club. December brought donors together for Cocktails and Caviar, hosted by Petrossian West Hollywood. The evening began with a special VIP caviar and smoked salmon tasting and continued with a cocktail party attended by numerous local supporters, including Brenda and Bob Cooke, Barbara and Steve Allen, and Betsy, Carl and Neville Anderson. The 40th anniversary year for St. Vincent Meals on Wheels wrapped up with a holiday party at the Hancock Park home of Brenda and Bob Cooke. MOW thanked its many friends who keep the mission going strong and who stand tall with the organization as it begins its 41st year. Learn more about MOW at stvincentmow.org.